"TITANIC" DISASTER. 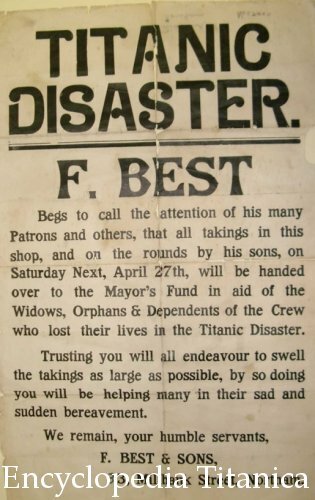 F. BEST BEGS TO CALL THE ATTENTION OF HIS MANY PATRONS AND OTHERS, THAT ALL TAKINGS IN THIS SHOP, AND ON THE ROUNDS BY HIS SONS, ON SATURDAY NEXT, APRIL 27th, WILL BE HANDED OVER TO THE MAYOR'S FUND IN AID OF THE WIDOWS, ORPHANS & DEPENDENTS OF THE CREW WHO LOST THEIR LIVES IN THE "TITANIC" DISASTER. TRUSTING YOU WILL ENDEAVOUR TO SWELL THE TAKINGS AS LARGE AS POSSIBLE, BY DOING SO YOU WILL BE HELPING MANY IN THEIR SAD AND SUDDEN BEREAVEMENT. WE REMAIN, YOUR HUMBLE SERVANTS, F. BEST & SONS, 33 MILLBANK STREET, NORTHAM."